If you require high availability (HA) or failover, follow the instructions below to manually configure multi-master replication (MMR) across multiple Gluu Servers. To simplify setup and ongoing operations of Gluu in an HA environment, we offer a tool called Cluster Manager with the Gluu VIP Subscription. Clustering uses OpenDJ replication and configuration changes to greatly improve Gluu Server availability, via a proxy. The following ports are used by different components to communicate with their peers at other nodes of a cluster. Additional configuration may be needed to ensure they can be reached by incoming connections. A minimum of four (4) servers or VMs: two (2) for Gluu Servers, one (1) for load balancing (in our example, NGINX), and one for redis. A separate NGINX server is necessary because replicating a Gluu server to a different hostname breaks the functionality of the Gluu web page when using a hostname other than what is in the certificates. For example, if you use cluster.example.com as the host and copy that to a second server (e.g. 138.197.65.243), the process of accessing the site on cluster.example.com, even with replication, will fail authentication due to a hostname conflict. So if node 1 fails, you won't be able to use Gluu Server effectively. First, install Gluu on one of the servers, node 1. It will be referred to as the "primary" for the sake of simplification. Once everything is configured, there will be no primary in the multi-master configuration. On all of the non-primary Gluu Cluster members (not the NGINX server, or the redis server), download the Gluu packages but don't run setup.py yet! After setup was completed on the primary server, node 1, a file named "setup.properties.last" was created in the same directory. Copy the /install/community-edition-setup/setup.properties.last file from the first install to the other server, node 2, as setup.properties. This will allow same configuration to be maintained across all nodes. Here, SSH access allows copying the file to other servers outside the Gluu chroot. Make sure that all hosts files are configured to point the IPs of all IDPs and the loadbalancer to the corresponding hostnames. Do not add the nodes' IPs in the /etc/hosts file of your Gluu container. They are configured automatically. If this throws a Permission denied error, that means the user, here myuser, does not have permission to write in the directory. Use the following command at the node you are trying to send the file to, here that is 138.197.65.243. Change <user> to the user used in the command above, here myuser. For security, the <user> should always be set back to root, so after finishing the file transfer, run the command again with root as <user>. If the Gluu server has not been started, start it and log in. Once the setup.properties file is in place on the other node(s), modify the IP to the current node. In the example, there is only one, so we changed our ip=159.203.126.10 of node 1 to the IP of node 2 server which is `ip=138.197.65.243. The rest of the configuration for the install should be automatically loaded, as shown below. Just press Enter. ** All clear text passwords contained in ./setup.properties.last. 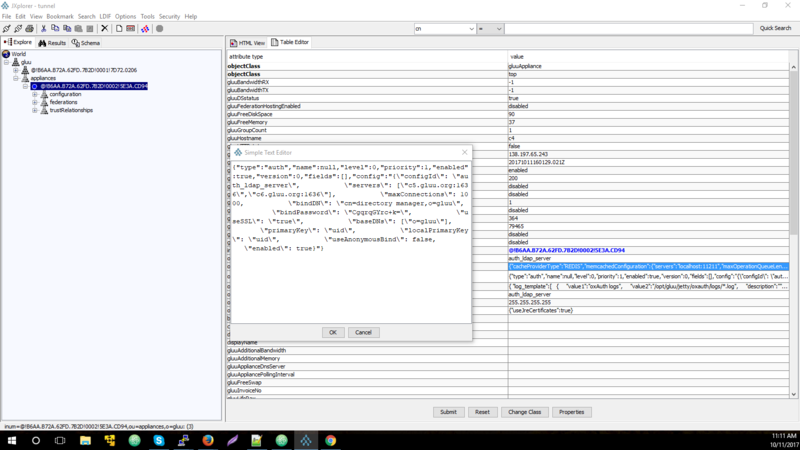 Any attempts to log in to the LDAP in any form might result in an instant timeout error, due to Java enabling Endpoint Identification, which disrupts LDAPS connections. Set the default value to true by explicitly stating it in the java.properties file. To set the new properties, run the command in the Gluu container. We need to make all nodes accessible to each other by setting the listening address to 0.0.0.0. In your command you may have to change cn=directory manager to your CN ( by default cn=directory manager unless changed ), and <password> to the password set in the first installation of Gluu on node 1. If the below commands are not connecting, try changing localhost to the nodes' explicit IP addresss, here that would be 159.203.126.10 and 138.197.65.243. Configuring Replication port on server 159.203.126.10:4444 ..... Done. Configuring Replication port on server 138.197.65.243:4444 ..... Done. Updating registration configuration on server 159.203.126.10:4444 ..... Done. Updating registration configuration on server 138.197.65.243:4444 ..... Done. contents of server 159.203.126.10:4444 .....Done. (use dsreplication initialize to do so). 3202 entries processed (23 % complete). 1233321 entries processed (100 % complete). Transfer it to the other nodes. The scp command will most likely not be installed in the Gluu container, so exit out by typing exit. Then transfer opendj_crts.tar to all the other nodes. Next, install Csync2 for file system replication on all nodes outside the Gluu container. Add more host <hostname> entries, according to the number of nodes you have. Copy the contents of csync2.conf into the file csync2.cfg. If you have your own load balancer, use the following NGINX configuration documentation as a guide for how to proxy with the Gluu Server. Send the httpd.crt and httpd.key certs from one of the Gluu servers over to the NGINX server. The following is a working nginx.conf example template for a Gluu cluster. Change all marked lines that correspond to your Gluu nodes and NGINX server. 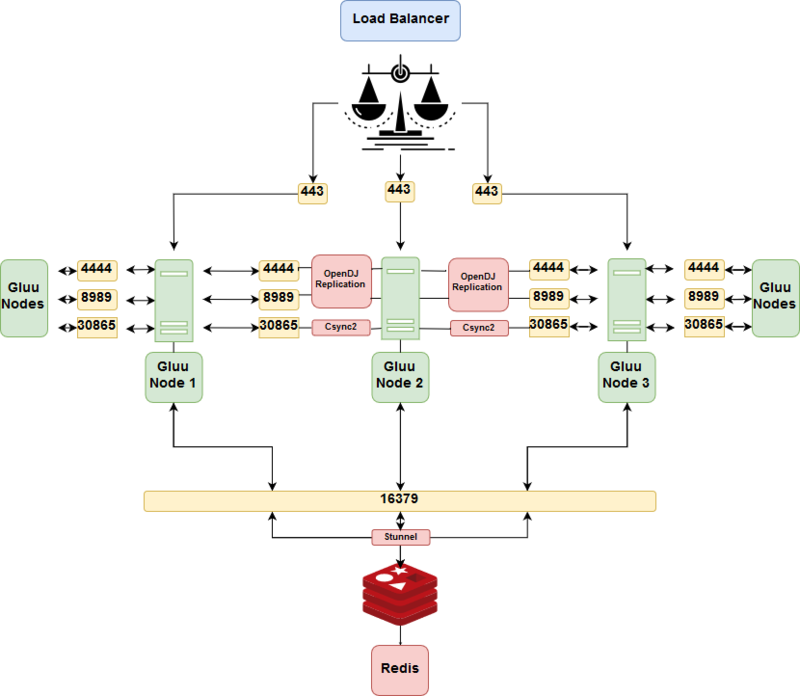 Redis-server is a memory caching solution created by redis-labs. It's ideal for clustering solutions but needs additional encryption. Now install and configure redis-server on a separate Ubuntu 18.04 server .You can set up a Redis cluster model and have them installed on all nodes. Place the configuration inside this file. accept from your external IP and connect to the binding IP you placed in the redis.conf file. Here we are unifying the connections inside the Redis server, accepting from the external IP and connecting to the localhost. This is important for the nodes to easily communicate to the Redis server. **It's a good time to check all servers, ensuring that the /etc/hosts file has all the IPs and hostnames as described in the beginning of this file. Remember for the nodes, it's the /etc/hosts file outside your Gluu container. 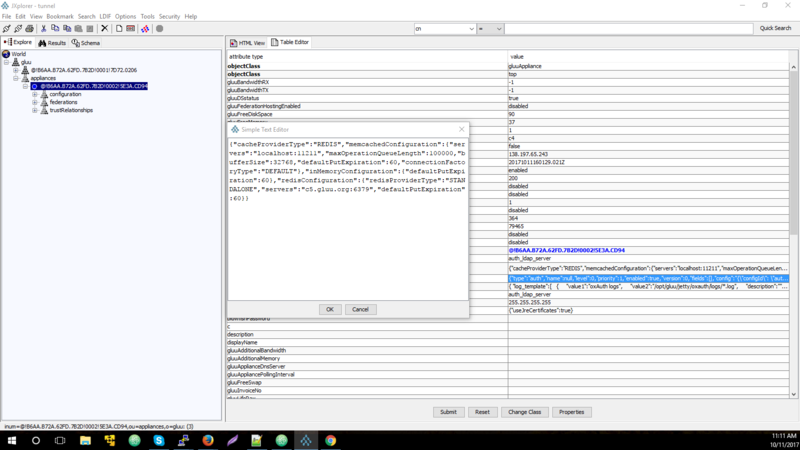 Place the configuration files inside this file. accept from your external IP and connect to the redis server IP. In the <hostname>, both IP (197.122.32.421) and hostname (redis.example.org) have to be working on all clients and the main redis server. Try to Ping, and you should get a PONG. For more information or if you're having trouble, please see this redis how-to guide. 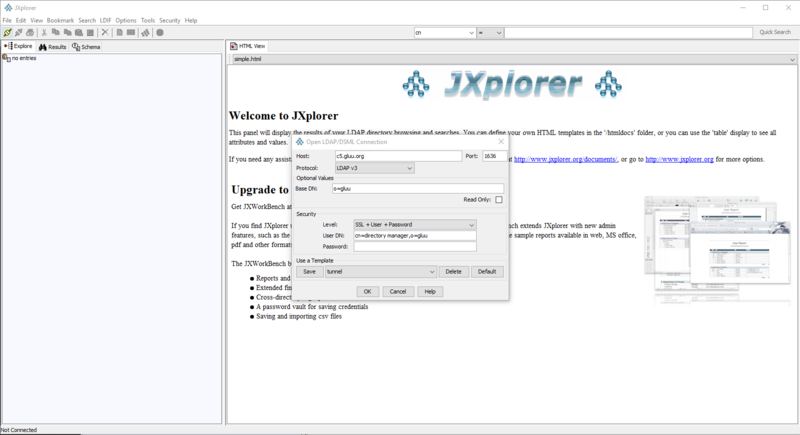 Use JXplorer (or a similar LDAP browser) to modify some of the JSON entries in LDAP for handling accessible caching and multiple authorization servers. Change "cacheProviderType" from "IN_MEMORY" to "REDIS". After that, in the "redisConfiguration" portion of "servers", I added "cluster.example.org:16379" which is the server I installed redis-server. Make sure that all LDAP servers are utilized for authorization by modifying the "oxIDPAuthentication" attribute. Copy certificates from the primary server Gluu is installed on and replace the certificates in /etc/certs/ on the other servers. This error is fine if OpenLDAP is not installed, and vice versa for OpenDJ. Now, the administrator web UI and oxAuth have some failover redundancy. There is obviously more configuration necessary on the network layer of the topology for true HA failover, but that is outside of the scope of this documentation.